Grouping of 3 Disruption churches built in pointed rubble with brick dressings. The only church in Scotland purpose-built to house 3 separate congregations, the Triple Kirks faced, in turn, congregations to the North, East and West. The East Church, which still stands, was remodelled in 1900 by William Kelly, and again in 1965. Only 3 exterior walls of the North Kirk survive, held up by scaffolding, along with the brick spire which takes inspiration from the old church of St Nicholas and from the Elizabeth Kirche, Marburg, Germany. 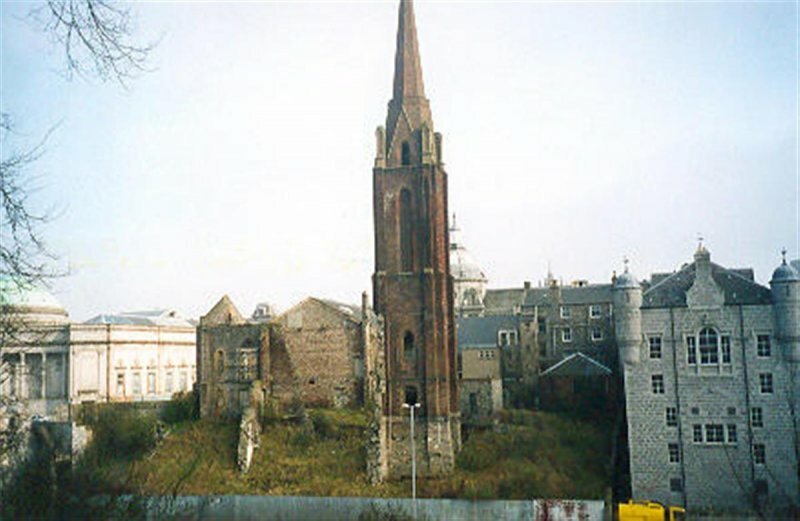 12 June 1995: The Aberdeen Press and Journal reports that City Councillors have approved a proposal by Barratt Commercials to develop the North Kirk site into a 5 storey office block, with the spire retained, after an original proposal was rejected. This follows an identical scheme of 1993, for which Planning Permissions lapsed. 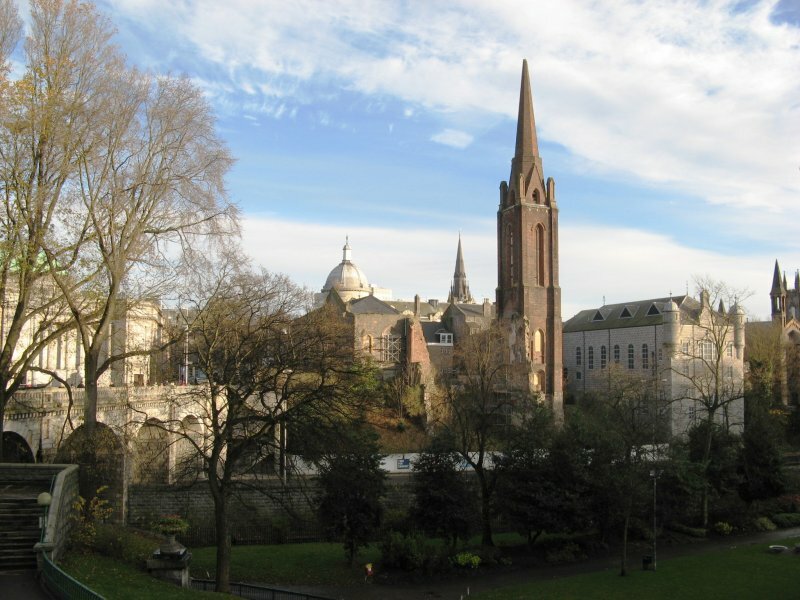 Aberdeen Civic Society and the Architectural Heritage Society of Scotland are against the design and scale of the plan. Much of the site is leased to Barratt Commercials by Minevco Ltd, under an agreement requiring the former to develop the site for office use. It is reported that Minevco are now seeking to terminate the lease in order to proceed with its own separate development plans. 22 April 1996: Press reports state that Planning Permission has been allowed to lapse for a second time. Architect Dr Bill Brogden of Robert Gordon University has produced a development masterplan for the area, and hopes that the Triple Kirks can now be incorporated. 10 March 1998: The Aberdeen Press and Journal reports that Barratt Commercials has submitted a development plan significantly smaller than its predecessor. 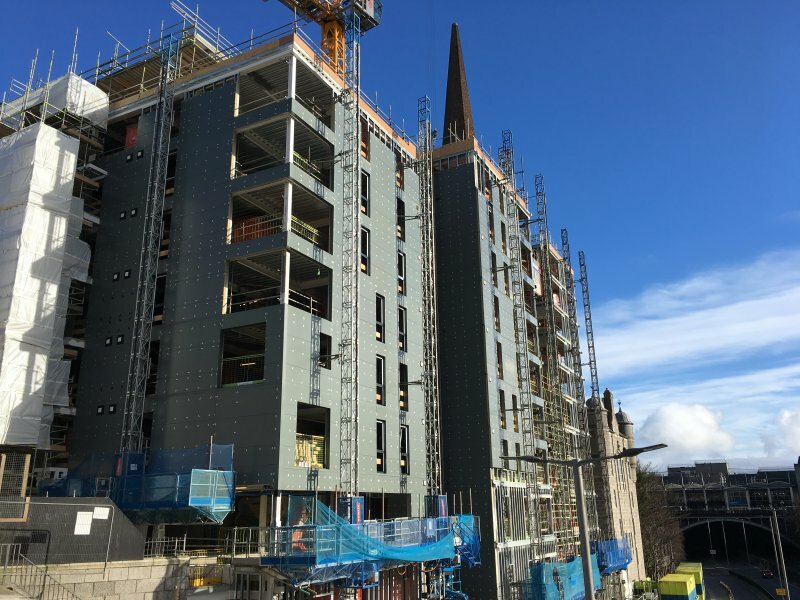 Litigation between Barratt Commercials and Minevco continues, but it is reported that delays to the redevelopment plan stem not from this litigation, but from a lack of interest from prospective tenants. Barratt Commercials hopes that the smaller scheme will prove more viable and more readily let. The redevelopment would include office accomodation for 150 people, and parking for 21 cars. The spire will be retained. 8 November 1997: The Aberdeen Evening Express reports that Grampian Enterprise is involved in negotiations to get the redevelopment of the site off the ground, and is prepared to invest substantial funds. Development plans, which retain the spire, have been drawn up by the William Cowie Partnership. An office block of 6 storeys will be serviced by underground parking for 120 vehicles. 30 March 2000: The Aberdeen Evening Express reports that Councillors have approved redevelopment plans that will provide office accomodation for 300 people on 5 floors, with 2 basement floors providing parking for 100 vehicles. The redevelopment, by Esson Properties Ltd, is scheduled to take up to 2 years and will see the spire integrated into a full-height glass atrium, floodlit at night. 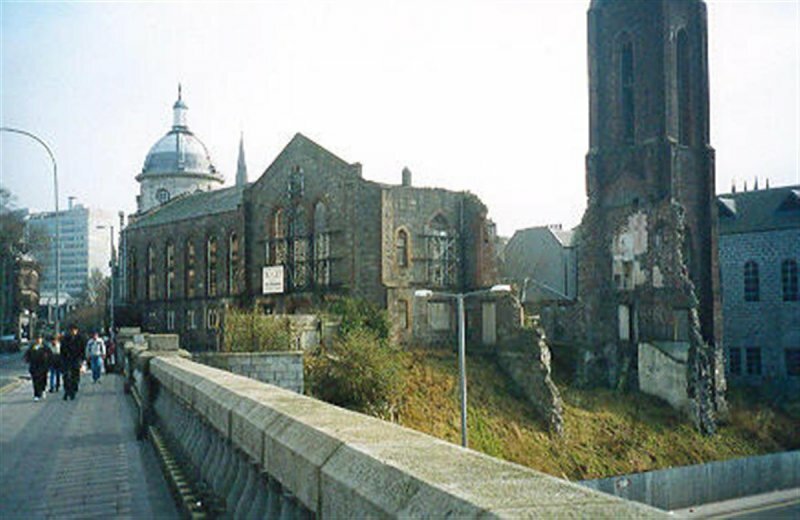 August 2000: External inspection would suggest that no work has yet taken place. The East Church remains intermitently occupied. May 2003: Local planners report no change. 5 June 2003: The Aberdeen Evening Express reports that the kirks could be transformed into a family history and architectural heritage centre, as part of a £1 billion revamp of the city centre. 15 November 2003: The Aberdeen Evening Express reports that Aberdeen Civic Society is calling for the kirks to be converted into an arts centre for the city. Esson Properties Ltd still intends to develop the site into offices, although room may be available for an arts venue of this kind. 14 September 2004: The Aberdeen Evening Express reports that Esson Properties is to survey the building and assess the potential costs of office conversion. 4 June 2005: The Aberdeen Press and Journal reports that demolition has emerged as an alternative option following the survey. 7 June 2005: The Aberdeen Evening Express reports that demolition may pave the way for a Council revamp of Union Terrace Gardens. 15 June 2005: The Aberdeen Evening Express reports that Esson Properties are now keen to pursue demolition to make way for glass and granite flats. 28 July 2005: The Aberdeen Evening Express reports that permission to demolish is now being sought. 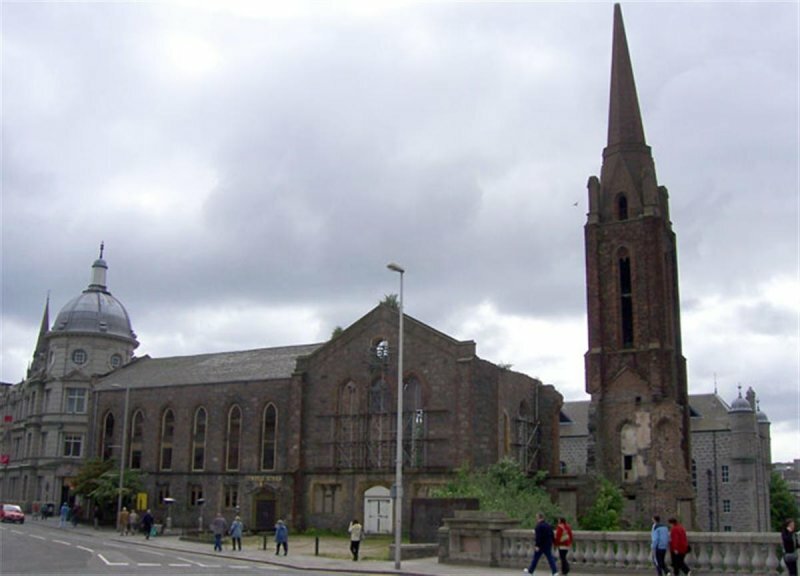 June 2006: Aberdeen Evening News reports that a proposal to demolish the church is to be put to councillors in August. Esson Properties are hoping to build 60 flats on the cleared site. Stating that the spire and superstructure are not economically viable to incorporate in to a development. 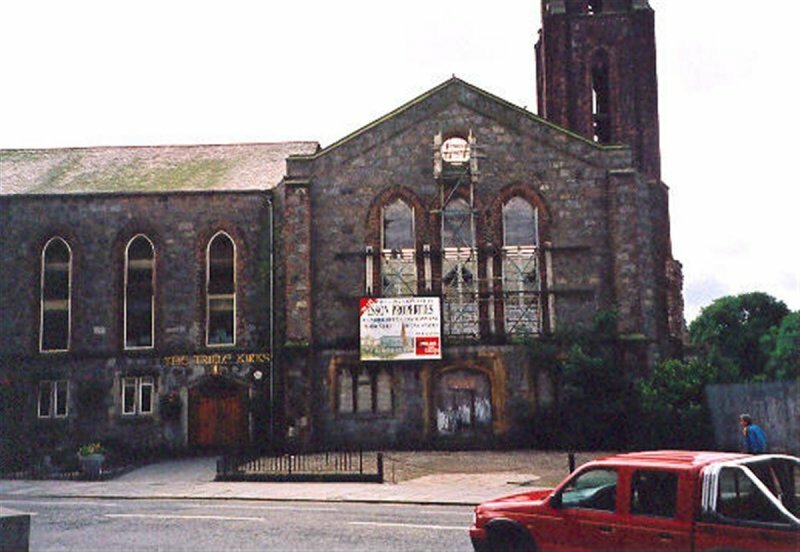 July 2006: Aberdeen Evening Express reports that Historic Scotland is to meet with owners to discuss the proposals for the future of the church. April 2008: The Press and Journal reports Stewart Milne Group have bought the property with a view to seek permissions for restoration and conversion into offices. June 2008: External inspection finds three remaining walls to the north, east and west survive propped up with scaffolding. The brick steeple to the south survives in a detached and vulnerable condition. The site is threatened by accelerated deterioration. June 2009: The Press & Journal reports that Stewart Milne Developments will lodge a planning application later in the year. The article also notes the progress of the wider scheme for the Union Terrace Gardens area of the city. September 2010: The Press and Journal reports on plans to convert the building into new city centre offices is due to be lodged with the local authority within weeks. A pre-application notice has been lodged with the council. Architect/ agent for the development is reported to be Halliday Fraser Munro for owners Stewart Milne Group. 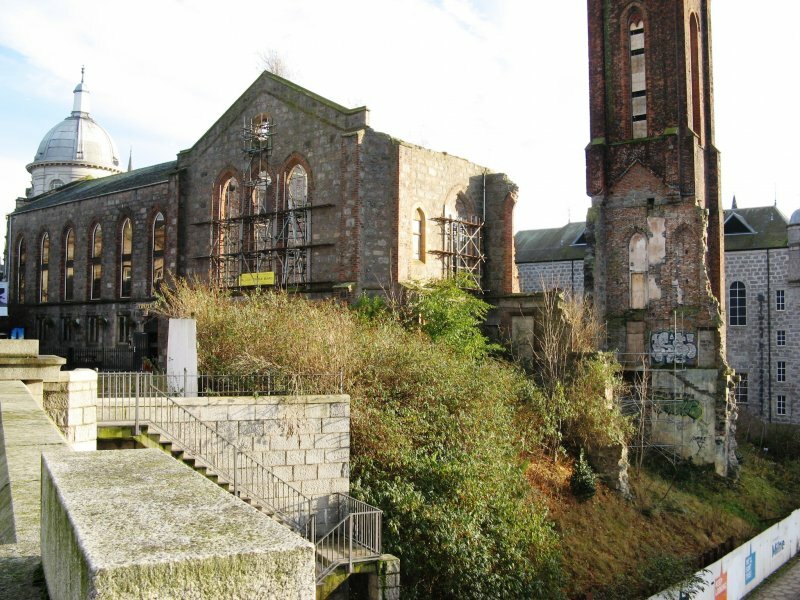 May 2011: Detailed planning permission for erection of an office development and associated car parking, remove remnant walls of existing North Kirk, retain and restore exisiting brick spire was lodged with Aberdeen City Council in March 2011 ref: 110303. August 2011: BBC news website reports the detailed planning application for the development of the site has been conditionally approved by Aberdeen City Council. No Listed Building Consent application is understood to have been submitted at this time. 29 November 2012: External inspection finds no significant change from the previous site visit. 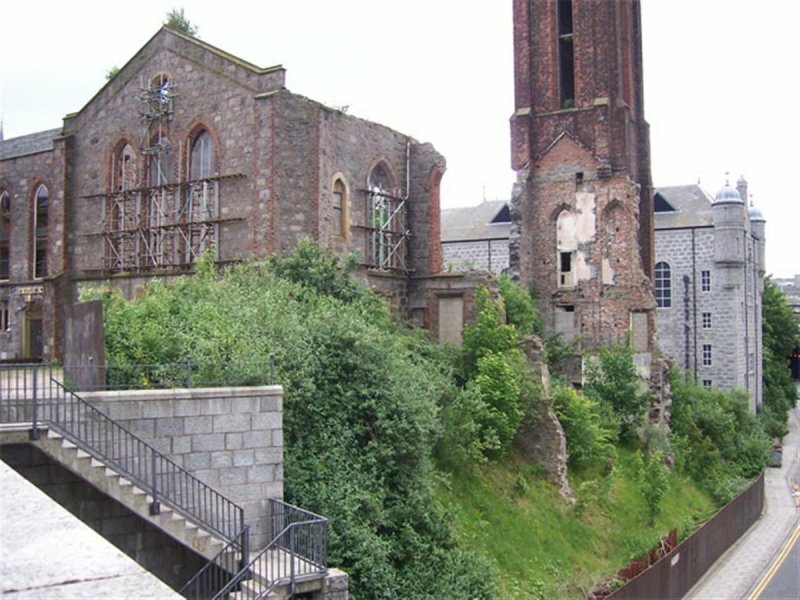 18 February 2014: Local planners advise work has started on the Triple Kirks site to restore and convert the building to offices. Moved to Restoration in Progress. 12 December 2017: A member of the public advises the development has been subject to variation with the end use now proposed as student accomodation. Whilst some clearance/preparation works were undertaken, these are reported to have stalled. 5 March 2019: External inspection finds the new development well under way. Difficult to survey fabric of historic building as it is being incorporated into new build. Move to Restoration in Progress. Aberdeen Public Library holds slides of Archibald Simpson's designs for the churches. Fraser (1978); Gammie (1909), p108.